Incredibly, she never missed a single day. Every single day I was away at camp there was a letter from my Mother waiting for me at mail call. Not once in five summers did she miss, not for me nor for my two sisters. She was, in fact, so concerned about us receiving daily mail that she actually started sending the letters before we even left home. Every summer evening she and my Dad drove ten miles to Birmingham to send out the mail. The post office was open late there. This was nice, of course but not a totally selfless act. Being out meant that my Dad might as well get some ice cream. My Dad, whose voice was always hovering in the background of my Mom’s letters, actually sent his own letter to us once. He laboriously scratched out a few sentences on a page, used his pocketknife to cut it neatly into pieces and addressed three separate envelopes set to wing their way to Camp Walden. We had to find each other and put it together like a puzzle to read it. He was pleased. Sometimes we sent letters back. We had to. If you didn’t hand in a letter three mornings a week you weren’t allowed into breakfast. Or so rumor had it. Receiving an actual letter from someone today is as rare as spotting a harvest moon. But I remember the pleasure of being able to identify people just by seeing their handwriting on an envelope. It was fun to think about just why someone chose a particular stamp. And there was always the delicious dilemma about whether to rip the envelope open or extend the mystery by opening the letter later. No matter if what was written was effusive or efficient, when I really think about it they were not letters so much as little gifts, something to hold, refold, and sometimes to cherish. Rants on reams of onion skin paper to stay in touch with friends overseas. Goofy cards doctored with bad poetry to soothe everything from a bad day to a sick day. Letters that sometimes took days and days to write to make sure something was said just the way one wanted to say it. The relief and sheer pleasure of a long awaited response. In thinking back it was not so much what was being said in a letter that mattered but the physical letter itself that counted. A letter proved that someone had not just thought of me, but had actually taken time to say so. The letter that I could hold in my hands proved it. So here we are all these years later, starry-eyed and jazzed in a communications Wonderland. Like everyone else I constantly draw my phone out of my pocket and with a few quick swipes, am instantly in touch with practically anyone at any time. You bet that’s thrilling too. I wouldn’t give it up for the world. Being in a communications Wonderland is especially wonderful when those we love most are often so physically far away. But the truth is some of us are more quietly deliberate thinkers. That can make instant responses of text and email, even phone conversations, pressured and terribly difficult sometimes. And of course, once something is said there’s no snatching it back. There are times when forty characters can be as crystalline and precise in expression as a haiku—others when a few more syllables might be needed to avoid utter misunderstanding and misuse. I remember the beautiful, even curves of my Mother’s handwriting. The tight spikes of my Dad’s printing. The big balloon letters of my old friend Helene. The quirky print of my friend Ruth. The controlled scrawl of my husband. Here I am though, as always, loving the rhythm and feel of my fingers flying over a keyboard. To some of us it’s sheer music. Leroy Anderson (go listen to “The Typewriter”) thought the same thing. I adore Blackwing pencils. I’ve experimented with fountain pens. But as I’ve mentioned before, I’m left-handed, and I smear when I write. But that doesn’t have to be the case. The way I figure it, if Django Reinhart could use his mangled left hand to become a master of Jazz guitar, with a little effort I can manage the far simpler task of not dragging my hand through pencil lead or fountain pen ink. No excuses. So here’s the plan. I’ll hang on to the cell phone, to email, to texting. But I can stretch and I can do more, I can really write with pen with pencil with paper. It doesn’t have to be often. But it can be once in a while. I can give myself the pleasure of writing. I can give someone else the gift of a letter. I’m a greedy little soul when you get right down to it. I want to create lasting connections in any way I can. I want the people I love to know it, without any question in their minds. But here’s the thing: I’m greedy for all of us. Grab a pencil and write. 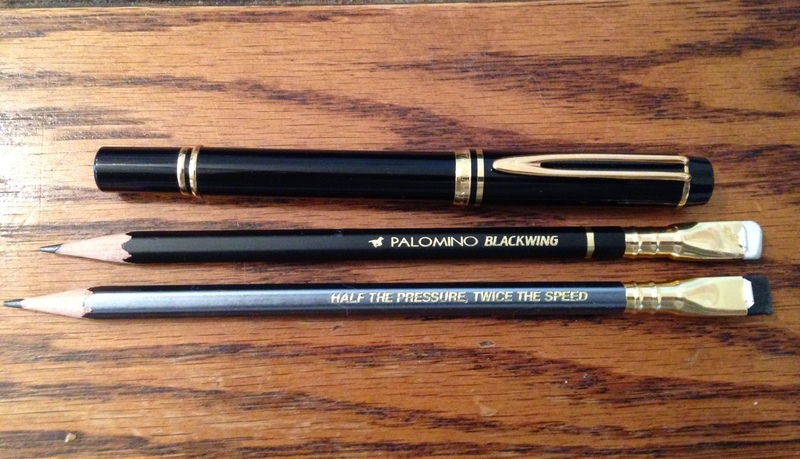 And trust me about the Blackwings. Those pencils practically write for you. Just get them started. “Half the pressure, twice the speed.” Have fun. Let’s all keep an eye on our mailboxes.